For those of you who are learning to play the Greek bouzouki and need some songs for your practice, this book might be for you. I have surfed the web to find Greek songbooks because I’m learning to play the Greek bouzouki and that’s best done by playing Greek songs. Here is a songbook with melody line and play along CD. I bought my Greek bouzouki from the bouzouki maker Babis Kleftoyiannis in Athens. Now I’m learning to play it and need books with songs to practice the Greek rythms and music in general. There are very few of them. 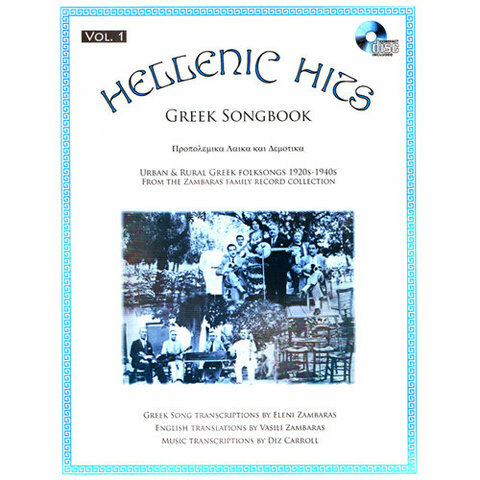 Therefore I was very happy to discover the songbook Hellenic hits Volume 1. 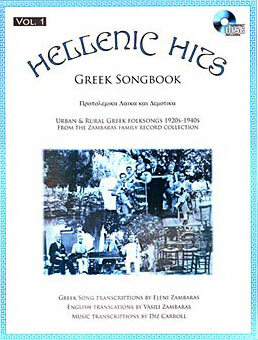 Hellenic hits Volume 1 is a little songbook that contains “Urban and Rural Greek Folksongs from the 1920’s to the 1940’s from the Zambaras Family Record Collection”. Included is a CD with real, authentic audio examples, recordings from the 1920’s and 40’s. Really charming. The book has 25 pages and contains nine songs. You have a melodi line and chords and the lyrics, of course. There are mainly minor and major chords in the book so they’re not difficult to play. In a Greek way (maybe) major chords are noted ordinarily, but if it says “E-” then you play Em and so on. If you are afraid you don’t understand the lyrics, I can assure you that the Greek lyrics are translatet to “greeklish”, that is the Greek alphabet is translated to latin letters and written almost like it is pronounced. The pronounciation is explained on the first pages of the book. There is also translation of the lyrics to English so you can understand what you are singing. In the last pages of the book there is an overview of recources for learning material in traditional Greek music. In Greece there are lots of exciting instruments and difficult rhythms compared to many other countries. In the beginning of the book the instruments and the rhythms you’ll meet on the CD are explained and commented. The ones used here are 2/4, 3/4, 4/4, which should be quite easy. There are also a couple of songs played in 7/8 and 9/4, the rythms Kalamantiano and Zembekiko – a bit more tricky! Listen carefully to the CD, localize the one and be clever to count, then you will manage. There are three main scales used on the CD, they too are described on the first pages. I recommend that you practise a bit on these before you start playing the songs. You don’t need to read music to play along with the CD. The sound examples are also very good if you have a bit trouble following the Greek rhythms. The keys on the CD are a bit different than the keys the notation in the songbook. This is because Diz Carrol has chosen the easiest key, I think. The other reason is that the pitch on the recordings are not standarized. These are old recordings and sometimes they play with an A in 430 instead of 442 which is standard today. Therefore it can be a bit hard play along on some of the songs. On others the pitch is almost 442. This problem can easily be solved if you play the CD on a computer and use Amazing Slow Downer (PC, Mac) or Capo (Mac). These programs do two things that is really helpful for musicians. They can change the pitch to a key that you prefer, and if the song ar a bit to difficult to play in the beginning, you can slow down the speed. The sound quality is still very good! They cost 49$ each. Often you will have to use chords a semitone over or below the notation. If you have problem with the transposing, use a Transposing wheel or an online Auto-transposer to help you. I will recommend the first one. You will learn a lot about intervals and chords by using a transposing wheel. This is a very nice little book with Greek songs, I am starving for more! Later The Diz Carrol company will publish two more volumes in this series. Now, Hellenic hits Volume 2 is published and contains love songs from Greece. Niser.no has reviewed it here. Volume 3 will contain party songs Rembetika. We are looking forward to the publishing of these too. I will review them when they are published. If you want to learn how to play the Greek bouzouki, I can recommend a very good instruction DVD called Learning bouzouki. Also take a look at the homepage of the band The Makedonians with the man behind Diz Carrol Music, Tom “Diz” Carrol. Hellenic hits volume 1 is published by Diz Carrol Music. 25 pages, binding saddlestick. Hellenic hits volume 1 can be ordered from Lark in the morning. If you don’t find the book by searching on title, search for BOK629. It costs 20 $. You can also contact Tom Carrol, on e-mail or ordinary mail: Diz Carrol Music, 1216 Pine St., Tacoma WA 98406 USA.